Chants of "Om Namah Shivaya" charged the air of Sivananda Ashram with Divine vibrations as they celebrated Sacred Maha Shivratri on Feb 23, 2009. Holy Shri Vishwanath Temple was agog with worship of Lord Shiva. It started with Shodshopachar Pujan at 4.00 am on Feb 23rd and continued until the next day 4.00 am. on Feb 24th). Continuous flow of devotees came to the Lord Vishvanath Temple to pray and seek the blessings of Lord Shiva – who is considered Ashutosh, who gets pleased very easily. The Siva Lingam was worshipped by washing it with milk, curd, honey and rose water as the chants of Vedic Hymns, Namakam, Chamakam, Rudram and "Om Namah Shivaya" in praise of Shiva continued. Shiva Lingam was adorned with special Shringar and Rev. Swami Adhyatmanandaji Maharaj performed Bhasma Arati. Shiva temple was full of Bel (Bilva) leaves, which were offered to the Lingam. Bel leaves are believed to be very sacred and the best offering to Lord. Also there is a strong belief that sincere worship of Lord Shiva on the auspicious day of Shivaratri, absolves person of sins and liberates him from the cycle of birth and death. Bhakti Sangeet (Devotional Songs) in praise of the Lord from 5.00 P.M. to 5.00 A. M through out the night by outstanding singers Sri Shyam Sankirtan group, Smt. Dr. Monica Shah of Aradhana School of Indian Classical Music, Pandit Sri Krishnakant Parikh, Sri Vikas Chandra Parikh, Sri Matang Parikh and Miss. Himali Vyas brought a special fervor to already charged atmosphere.On 24th mid-day a grand Bhandara was served to hundreds of devotees at the ashram. Mr. Nitin Mukesh (a famous Cine Artist and singer) also visited ashram with his family and paid homage to Lord Vishwanath on Shivratri Festival. Mahaprasad was served to all on next day..
17th Advance Yoga Teacher's Training Course for advanced Yoga students was organized through SIVA( Sivananda International Vedanta and Yoga Academy )at Sivananda Ashram, Ahmedabad from Feb 12, 2009 – March 3, 2009. This was for a special group of dedicated and committed yoga teachers from Taiwan and Japan. The entire group consisted of 34 participants of senior yoga teachers from Taiwan. “We have learned the Science of Yoga, Pranayam and in depth Psychosomatics of Yogic life at Sivananda Ashram.During the three weeks at the ashram we were taught yoga, based on Patanjal Yoga Darshan.We have been concentrating on Yoga postures but to learn all different aspect of Yoga way of Life is a real key to Peace, happiness and Bliss.”- These were the feelings in general of the yoga participants. On completion of course and candidates went through the exam. 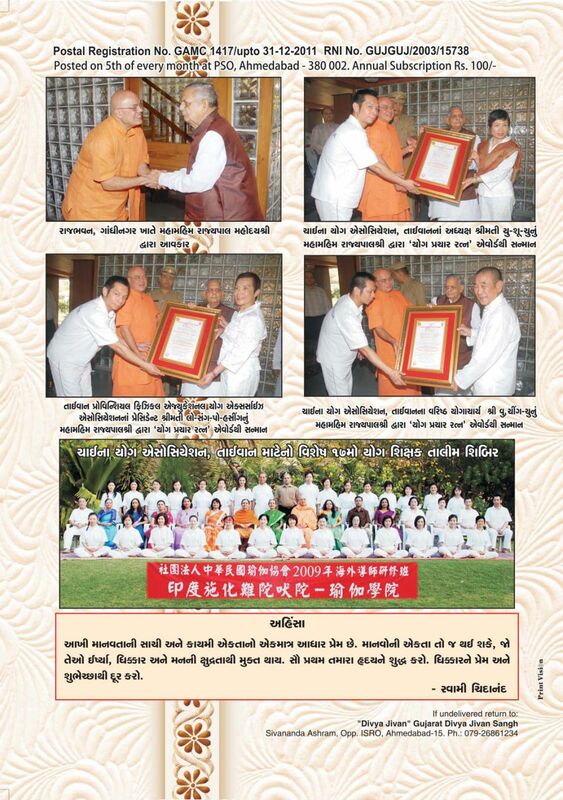 Award ceremony was performed by H. E.Governor of Gujarat Sri Nawal Kishor Sharmaji at Rajbhavan ,Gandhinagar.President of China Yoga Association and President of Taiwan Yoga and Sports Authority and also very Senior Yoga Director Yogi Wu were honored with a special title of “Yoga Prachar Ratna” by H. E. Governor of Gujarat.. Spiritual Retreat (Mauna, Dhyana & Japa Shibir) (Feb 1, 2005- Feb 5, 2009) Gujarat Divya Jivan Sangh organized five- day Spiritual Retreat in Sri Rang Sadan Nareshwar at the holy ashram of Sri Rang Avadhootji Maharaj, located on the banks of Narmada River. Seventy Sadhaks from all over Gujarat including Sri Swami Adhyatmanandaji Maharaj attended the retreat. The program consisted of one and half hours of group meditation 5.30 A. M. to 7.00 A. M., 8.30 A.M. to 10.00 A. M., 10.30 A. M. To 12.00 noon, 2.00 P.M. To 3.30 P. M., 4.00 P.M. to 5.30 P.M. and 8.00 P. M. to 9.00 P.M six times a day. For rest of the day sadhaks in total silence spent their time in prayers, japa and spiritual reading. Satvik and salt less simple food was served to all during their stay. Dr. Sri Indubhai Amin, devotee of Lord Dattatreya looked after the comforts, lodging and boarding of sadhaks for which members of spiritual retreat are highly indebted to him. 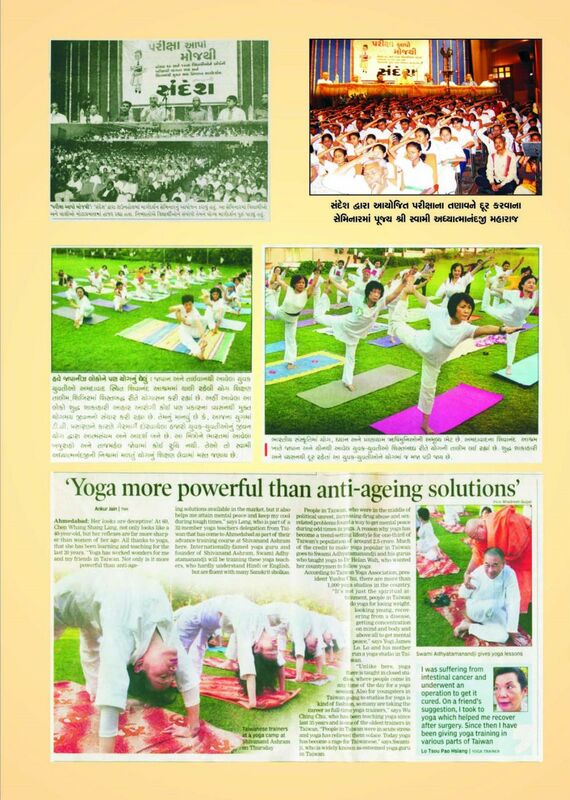 Sadhaks returned homes enriched and wishing to have such retreat more often. Bharat Scouts and Guides Centenary Jamboree 2009 was held at University Ground in Ahmedabad. About 7000 Scouts came from all over India to attend this one of a kind function including, H. E. Governor of Karnataka Mr. Rameshwar Thakkar, Mr. Nitin Shah , Home Minister of Gujarat and H. H. Sri Swami Adhyatmanandaji Maharaj from Sivananda Ashram. Mr. Fakir Waghela Minister of Social Justice and Justice Mr. Kalpesh Zaveri also attended the concluding session of National Jamboree of Bharat Scouts and Guide. On Feb 25, 2009 forenoon Sri Swamiji Maharaj addressed a large gathering of Grade 10th & 12th High School Children. Swamiji's helpful Tips to the children “Give Exam (Tests) cheerfully” without any tension were really moving. This program was organized by leading News Paper Sandesh at Town Hall, especially for the benefit of students in the stress during Examination. On Feb 28, 2009 fifty two Tricycles were distributed to fifty two handicapped people at the ashram. This was possible because of the kind support of Dr. C. T. Mehta Rehab Centre, Baroda. Each Tricycle was customized and personalized for fruits hawker, flower merchant or tea staler, as per the preference of the disabled individual. Lunch was served to all disabled and their assistants. Also to all the volunteers from Blind man Association and Dr. C. T. Mehta Rehab Center, Baroda. Special thanks to Sri. Jaywant Mehta, who is the Director of Rehab Centre. Mumbai (Feb 7, 2009) - Sri Vadnagar Nagar Mandal, Mumbai celebrated its Centenary festival in holy presence of H. H. Sri Swami Adhyatmanandaji Maharaj. 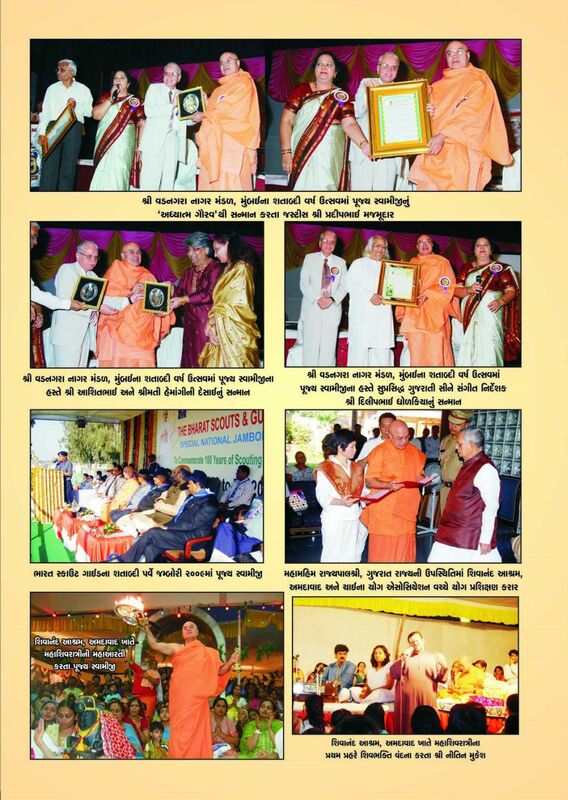 On this occasion number of prominent people of Nagar community were felicitated by Sri Swamiji Maharaj. Also Pujya Sri Swami Adhyatmanandaji Maharaj received an honor of "Adhyatma Gaurav" by Justice Majmudar of Mumbai High Court. Mrs. Vishaka Maulesh Pota needs to be congratulated for this wonderful and memorable event. During his stay Rev. Sri Swamiji visited number of devotees homes and blessed them including Dr. Sri. Anil and Mrs. Abha Suchak family members at Malad. Vadodara (Feb 15, 2009) Upon very sincere invitation of Life Insurance Corporation, Vadodara branch, Sri Swami Adhyatmanandaji Maharaj visited Vadodara addressed a big gathering of about 1200 LIC Agents on the subject of " You are the Key". Mahatma Gandhi Memorial Hall was packed to its maximum capacity, where Sri Swamiji addressed everyone for full three hours and the entire program was concluded with a interesting question and answers session and special Prayers for World Peace.